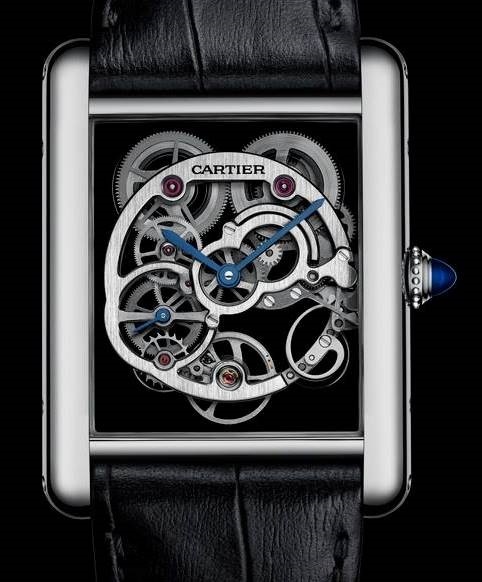 With a movement which has been skinnied to its bare bones, this is the new Cartier Tank Louis Cartier Sapphire Skeleton. Spooky, weird and eerie - that's what some of my "non-watchy" friends described this one as and, there are even some watch enthusiasts who feel strongly that such a construction falls foul of displaying just a tad too much hairy wrist on the look-see. I however am prepared to overlook this detail and come out in favour of the craftsmanship involved in producing such an exquisite labyrinthine panorama. This piece is distinguished by a round sapphire base plate which cradles the movement. The rounded forms of the components on show should be at odds with the classic tank outline, but it does in fact provide the perfect frame. This is to my knowledge the first skeleton Tank in quite a few years - a product of the talented leadership of one of the best ladies in the business, Carole Forestier-Kasapi no doubt. The piece features a few innovations including rubber buffers set between case and plate, small enough to provide the illusion of a floating calibre, strong enough to ensure that the movement is safe from shocks. The Cartier Tank Louis Cartier Sapphire Skeleton is powered by the Cartier Calibre 9616 MC and the case is made from white gold. Blued steel hands and a blue sapphire cabochon crown perfect its stying. More Cartier in our archives. The Schofield Signalman DLC - Rugged, Dependable..... and FREE!